The Dynamic Coast research project continues in 2018, building on the earlier National Coastal Change Assessment. The next phase will map and categorise the resilience of Scotland’s natural coastal defences (i.e. identifying where low dunes may breach), it will estimate how future climate change may exacerbate erosion on our soft (erodible) coast. It will incorporate the latest monitoring techniques to inform natural resilience and vulnerability of our shoreline. At five ‘super sites’, including St Andrews, Montrose and Skara Brae we will forecast future change, anticipated damage and develop mitigation and adaptation plans with stakeholders. This will help demonstrate the applicability and need for adaptation actions across the public sector. Importantly it will also consider the social justice implications of existing and climate change exacerbated coastal erosion in Scotland. The project specification is available here. Prof. Jim Hansom at the University of Glasgow will lead up an expanded team, working closely with the steering group and project partners. Watch the Cabinet Secretary Launch the 2nd phase of research (here), the BBC News piece (here) and read the following press: The Scottish Government, The BBC, The Scotsman and The Courier. 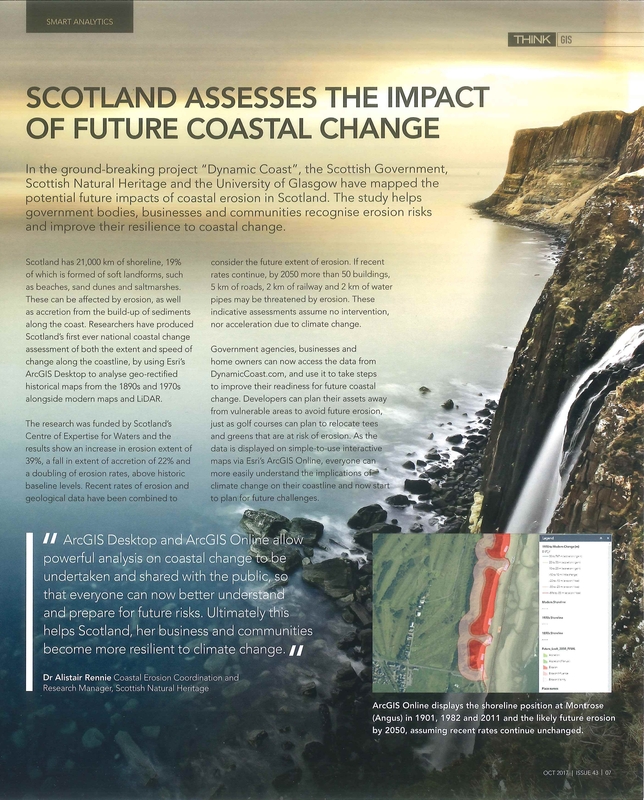 The Dynamic Coast team presented their research at Scotlands leading mapping conference in Perth. The presentation is available here and it outlined why the research was carried out, how we did it and what the key results were. It also explained how the very latest technology is being used to support the next phase of the work. A magazine artile was also produced. Roseanna Cunningham MSP Cabinet Secretary for Environment, Climate Change and Land Reform launched Dynamic Coast in St Andrews on the 4th August 2017. Her Keynote speech is available here. Dr Alistair Rennie and Prof Jim Hansom also presented a summary of the results, available here. The Dynamic Coast was also mentioned within the Cabinet Secretary for Environment, Climate Change and Land Reform, Roseanna Cunningham MSP, opening address. You can read a transcipt of this speech here. Dr. Alistair Rennie presented the latest results from the NCCA at the the "How can we learn to live with floods? Challenges for Science and Management", hosted by the Royal Society of Edinburgh. The poster can be seen here. Two workshops were held at Victoria Quay (Scottish Government – 29th August 2016) and Great Glen House (SNH – 31st August 2016) to inform and update local authorities and project partners on the progress made within the NCCA as the project nears completion. The workshops consisted of two parts – the first included a presentation of the policy context, science, methods and preliminary results. The presentation can be accessed here, with a video of the talks available soon. The second part of the workshop consisted of a practical demonstration of the web maps, showing users how to access and use the different datasets and features found on the maps. If you were a participant at either of the workshops and wish to contribute any further feedback please get in touch. A journal article has been published by three member of the working group which is highly relevant to the NCCA. The Coastal Erosion Susceptibility Model(CESM) developed by Dr. James Fitton, Dr. Jim Hansom, and Dr. Alistair Rennie is used with the future look methodology within the NCCA, and an article describe the construction of this model is now available via open access below. Pascal Lardet of SEPA will be presenting at the Coastal Practitioners Conference held in Wales, on the 27th April 2016. Details of the NCCA will be included as part of Pascal's presentation at the conference which will bring together coastal risk management practitioners from across the UK including representatives from NRW, Welsh Government, Local Authorities, the EA, infrastructure owners and incident responders. Dr. James Fitton presented an update of the National Coastal Change Assessment Project to the Tay Estuary Forum (TEF) at their annual conference on the 22nd April 2016. You can download the presentation here. Dr. James Fitton presented the latest work from the CCA at the Flood and Coast Conference on the 22nd February 2016. The presentation given at the conference is available here. The presentations given at the SNIFFER Flood Risk Management Conference by Dr. Alistair Rennie, and Dr. Jim Hansom are now available online here. The NCCA team will be giving two presentations at the upcoming Sniffer Flood Risk Management Conference 2016 on the 2nd & 3rd January in Edinburgh. Dr. Alistair Rennie will be presenting on the first day of the conference "The National Coastal Change Assessment as an evidence base for coastal spatial planning", with Dr. Jim Hansom presenting the following day on "Using 3D models to inform coastal change and its impact". Following this there will also be a presentation at the Flood and Coast Conference on the 23rd February 2016 in Telford. Dr. James Fitton will be presenting "Scotland's dynamic coast - the national coastal change assessment" which will introduce the NCCA, and discuss some of the preliminary results.